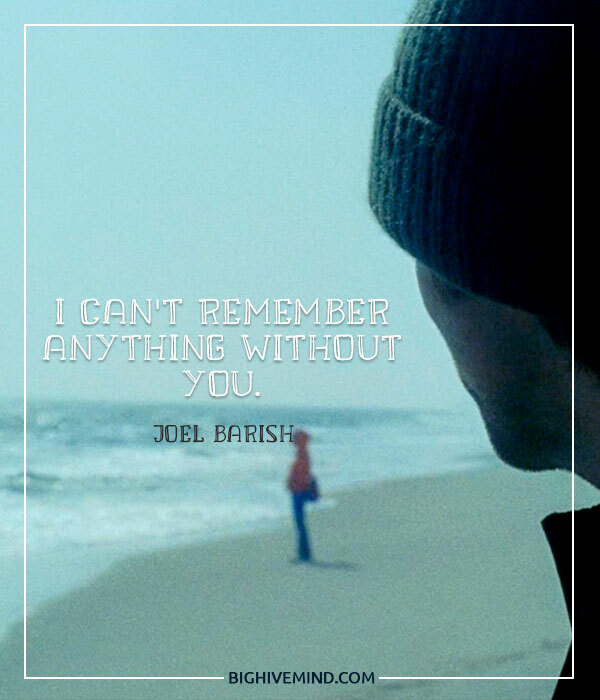 Eternal Sunshine of the Spotless Mind is a quirky movie released in 2004 starring Kate Winslet and Jim Carrey. 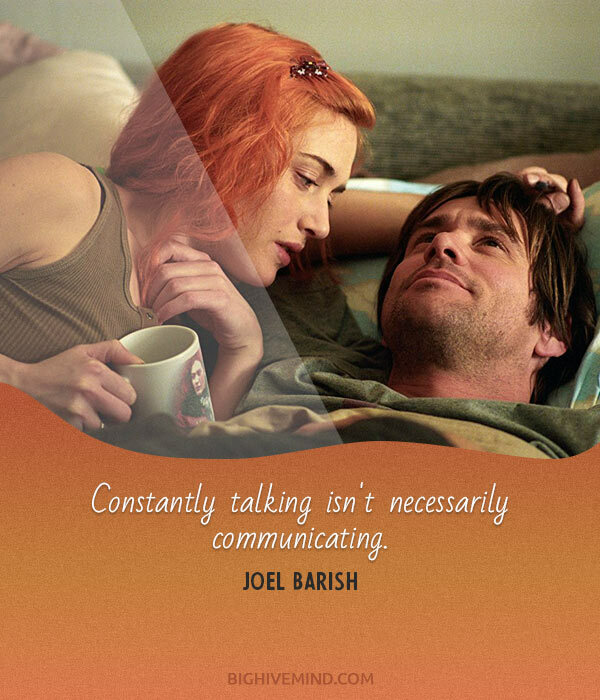 In the film, Kate Winslet’s character Clementine and Jim Carrey’s character Joel Barish fall in love. They don’t realize that they have been lovers before but have had their memories of each other erased. In a famous scene from the film, the two characters are sad that they met at the wrong time. The film is a meditation on what it means to be together and whether we have soul mates. 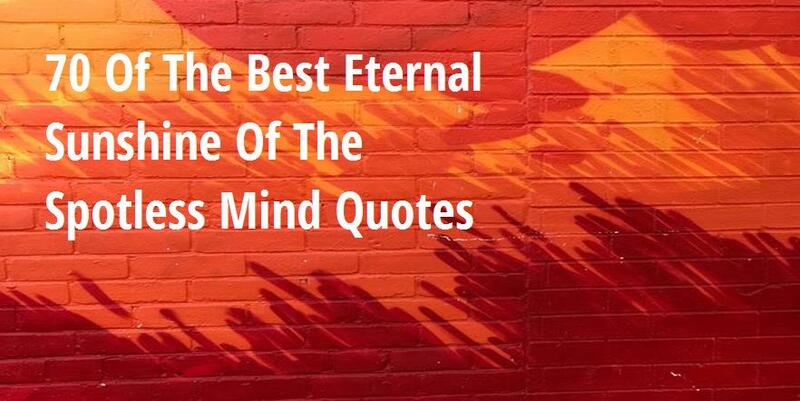 These quotes will inspire you while making you laugh. I wish I had stayed too. NOW I wish I had stayed. I wish I had done a lot of things. I wish I had… I wish I had stayed. I do. Too many guys think I’m a concept, or I complete them, or I’m gonna make them alive. But I’m just a f*cked-up girl who’s lookin’ for my own peace of mind; don’t assign me yours. What?… What do you *want* Joel? But you will! But you will. You know, you will think of things. And I’ll get bored with you and feel trapped because that’s what happens with me. This is it, Joel. It’s going to be gone soon. Are we like those bored couples you feel sorry for in restaurants? Are we the dining dead? I can’t stand the idea of us being a couple people think that about. 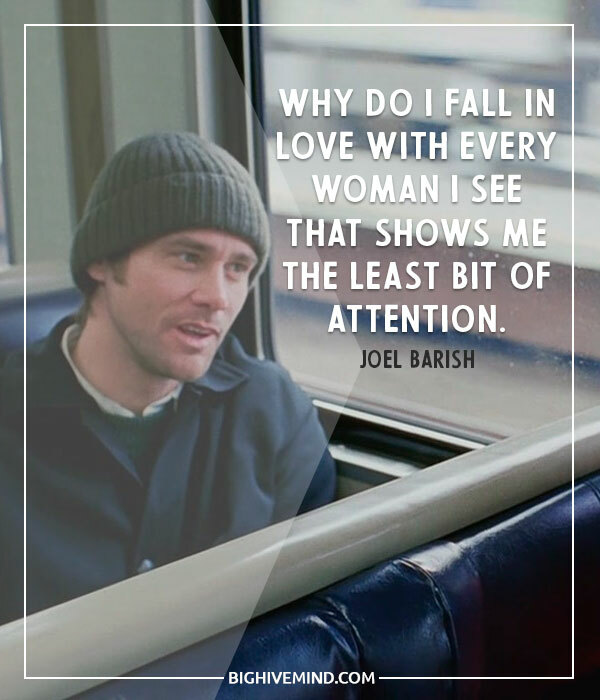 Why do i fall in love with every woman I see that shows me the least bit of attention. Look, I’m sorry if I came off a little nutso, I’m not really. I can’t see anything I don’t like about you. Aw, that’s… very sweet, but try. Yeah. I thought you knew that about me. I ran back to the bonfire, trying to outrun my humiliation, I think. Remember me. Try your best. Maybe we can. Can it cause brain damage? I had a really nice time last night. I had the best f*cking night of my entire f*cking life, last night! I could die right now, Clem. I’m just… happy. I’ve never felt that before. I’m just exactly where I want to be. I don’t know! I want you wait for just a… a while. I don’t need nice. I don’t need myself to be it, and I don’t need anybody else to be it at me. Hi. Didn’t figure you’d show your face around me again. I guess I thought you were… humiliated. You did run away, after all. If only I could meet someone new. I guess my chances of that happening are somewhat diminished, seeing that I’m incapable of making eye contact with a woman I don’t know. I want to read some of those journals you’re constantly scribbling in. What do you write in there if you don’t have any thoughts or passions or… love? You know me, I’m impulsive. My embarrassing admission is I really like that you’re nice, right now. I don’t know! I DON’T KNOW! I’m lost! I’m scared! I feel like I’m disappearing! MY SKIN’S COMING OFF! I’M GETTING OLD! Nothing makes any sense to me! NOTHING MAKES ANY SENSE! Joel, look at me. You’ll remember me in the morning, and you’ll come to me, and you’ll tell me about us, and we’ll start over. Not yet, not married. No, I’m not married. I walked out the door. There’s no memory left. Look at it out here! It’s all falling apart. I’m erasing you, and I’m happy! You did it to me first. I can’t believe you did this to me. Clem! Did you hear me? By morning, you’ll be gone! The perfect ending to this piece of sh*t story! I thought maybe you were a nut. But you were exciting. That’s okay, I really didn’t think you were. Well, technically it is brain damage. You don’t tell me things, Joel. I’m an open book. I tell you everything, every damn, embarrassing thing. Really? There’s a stalker book? Great, I gotta read that one. What can I say, Joel? 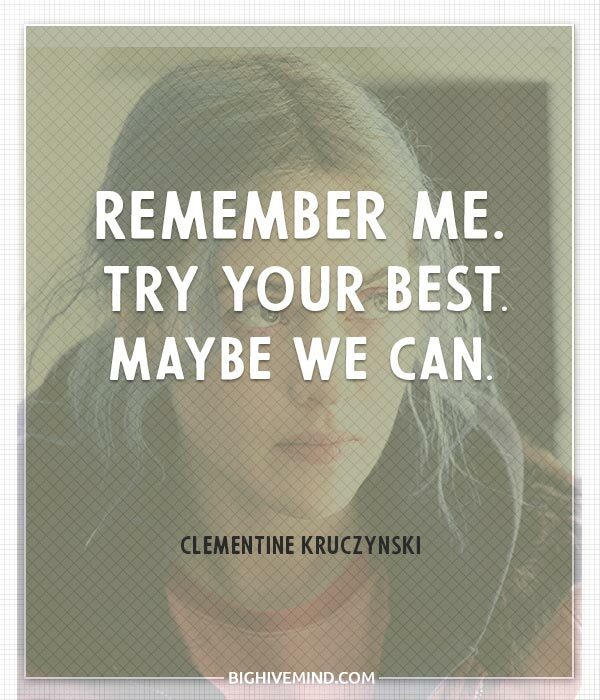 You know Clementine. She’s like that. She’s … impulsive. She decided to erase you almost as a lark. When I was a kid, I thought I was. I can’t believe I’m crying already. Sometimes I think people don’t understand how lonely it is to be a kid, like you don’t matter. So, I’m eight, and I have these toys, these dolls. My favorite is this ugly girl doll who I call Clementine, and I keep yelling at her, “You can’t be ugly! Be pretty!” It’s weird, like if I can transform her, I would magically change, too. Our files are confidential Mr. Barish so we can’t show you any evidence. Suffice it to say, Miss Kruczynski was not happy and she wanted to move on. We provide that possibility. Look man, I’m telling you right off the bat I’m high maintenance. So I’m not gonna tip-toe around your marriage or whatever it is ya got goin’ on there. If you wanna be with me, you’re with me. Well, it is pathetic. And it’s f**king irresponsible. You could’ve killed somebody. I don’t know, maybe you did kill somebody. Should we turn on the news and see? Should I check the grille to see if there’s children or small animals? Can you hear me? I don’t want this any more! I want to call it off! It’s amazing, isn’t it? What Howard gives to the world? To let people begin again. It’s beautiful, you look at a baby and it’s so pure, and so free, and so clean, and adults are like this mess of sadness and phobias, and Howard just makes it all go away. You’re driving drunk. It’s pathetic. I was a little tipsy. Don’t call me pathetic. I don’t know, I felt like a scared little kid. It was above my head; I don’t know. I’m sorry… I just, my life isn’t that interesting. I came back downstairs, and you were gone. I kinda sorta wrecked your car. We are David and Ruth Laskin. Which one do you want to be? I prefer to be Ruth, but I’m flexible. I’m not a stalker. YOU’RE the one that talked to me, remember? Joely, don’t ever leave me. You’re not a stalker, or anything, right? That is the oldest trick in the stalker book. Now, the first thing we need you to do, Mr. Barish, is go to home and collect everything you own that has some association with Clementine. Anything. We’ll use these items to create a map of Clementine in your brain, okay? So we’ll need photos, clothing, gifts, books she may have bought you, CDs you may have bought together. Journal entries. You want to empty your home, you want to empty your life, of Clementine.